Copenhagen absolutely exceeded my expectations, talk about a hip and happening city. I rented a bike for the first two days and ended up extending my rental another three. With colorful facades around every corner, multiple canals, and a serious obsession for wine, I'd be more than willing to relocate. Also on the pricier side, especially for hotels, the food and wine was well worth it. Hotel: I rented an apartment via Air BnB (this one) and the location (near Skindergade and Klosterstraede streets for reference) couldn't have been better. The living and dining were super bright and very comfortable. If you're a hotel kind of person, check out Hotel Manon Les Suites. This beautiful oasis has a fun indoor pool, rooftop bar and very mid-century, Danish design. Also, we went to the Sanders Hotel for breakfast and it was beautifully classic with a stunning sun-room bar on the roof. The garden is perfect for breakfast or lunch if you have good weather. Ved Stranden 10 - This stunning wine bar is situated in a very old building overlooking one of Copenhagen's central canals. The list is non-existent and ordering is strictly verbal. Love that. The reds and whites I tasted the few times I ventured in here were spot on with my request. This place is a must for wine lovers. Mikkeller - There are a few of these beer shop/bars around Copenhagen and they're full of all the best craft beers, local and international. The location on Refshaleoen is super trendy and right on the water. Mother - This is a wine shop and tasting bar right in the best shopping area. They also own a restaurant by the same name with outstanding brunch on the weekends. R bar - A very chill wine bar near Mother with an extensive Italian list. Nebbiolo - An All-Italian wine bar right in Nyhavn - the most colorful, most photographed street/canal in the city. Bronnum cocktail bar - A luxurious cocktail bar in the center of town, little bit boojie but phenomenal drinks and seriously knowledgeable bartenders. Baest - Just over the river in the up-and-coming Norrebro neighborhood, I'd recommend this farm-to-table Italian-Danish spot above anything else. Hands down this was the best pizza I have ever had. Don't forget to ask the waiter about "Rudo" their speakeasy-style Vermouth bar upstairs. Drink tokens will follow. September Atelier - A beautifully designed café in the morning, wine bar/shop at night. I was very impressed with the coffee and avocado toast. Reffen - Located on Refshaleoen (an old industrial area that was once home to B&W shipyard. 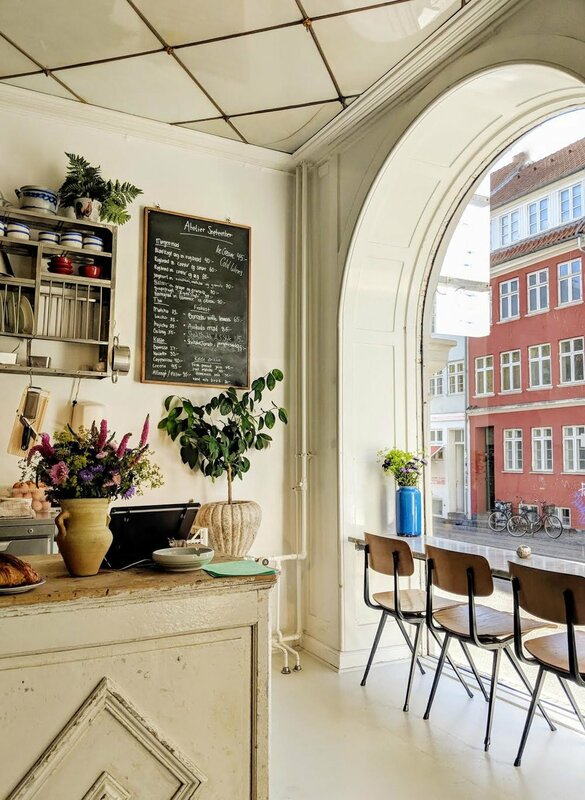 Now it's home to café's, restaurants, events etc, just 15 mins from Copenhagen by bike). Reffen is a massive outdoor international food hall. Each vendor has their own shipping container, which they've decorated to showcase their cuisine. I had sushi, pad Thai, tacos, and a burger, all of which were delicious. Manfreds - Owned by the same crew as Baest, this mainly vegetarian spot focuses on local, sustainable and organic produce. However, they're known for their beef tartare, which is unreal. Kodbyens Fiskbar - Seafood heaven, this Meatpacking restaurant is known for their oysters, but the scallops and mussels were just as delicious. A very cool, industrial/nautical vibe with circular fish tanks and delicious wines, from vintage Champagne to Georgian Orange. Torvehallerne - This indoor food market is where to taste the local SMORREBROD. They're like tapas with salmon, beef, shrimp, or veggies on bread and can be found throughout both buildings. When inside: Gorm's for delicious pizza, Kopan for Korean street food, and Lele for great Vietnamese bahn mi. Husted Vin - This is a traditional wine shop with many recognizable wines from all over the world. It's also in a unique area with a lot of cafes, great for a walk. Canal Tour - I purchased the Air BnB experience and it was marvelous. They stock a picnic basket full of beer and snacks while a local guide points out all the areas of attraction, museums and government buildings. Do it at sunset for great pics! Rodeo Hair Salon - If you need a trim or want a blow-out, go to Rodeo! They have a cafe and bar, and the stylists are amazing (have been featured dozens of places), and not too pricey.